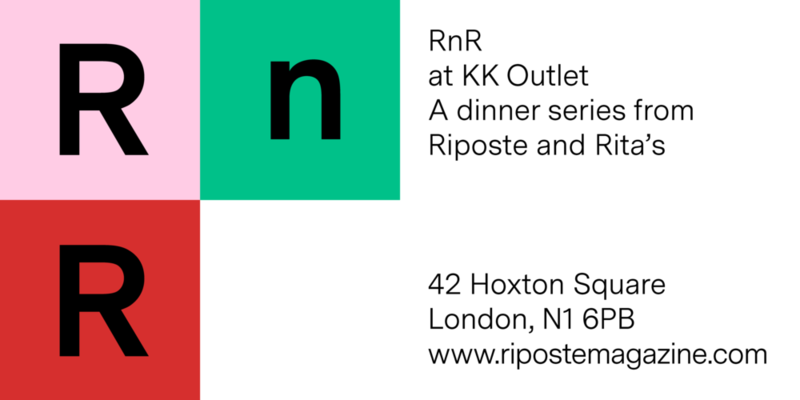 To celebrate the release of issue #9, Riposte will be hosting RnR - a short run restaurant in collaboration with Rita’s from 27 - 29 November..
Over three nights Missy and Gabe of Rita’s will bring their big flavor cooking and exciting alcoholic blends to an intimate space in KK Outlet. For the occasion Rita’s have devised a delicious four-course menu that will be accompanied by a welcome drink, a first course cocktail and wine pairings offered separately. For each evening we have curated a line up of inspiring women to give short talks in between courses on topics linked to the new issue. All seats are limited and must be booked in advance - you can book yours here. Tickets are £40 each and include four-course menu, welcome drink and first course cocktail. Wine with dinner can be purchased separately.